Be blown away by the magic of New Zealand’s South Island with campervan hire in Christchurch. Hiring a camper van in Christchurch puts you at the heart of this magnificent island, and some of New Zealand’s most impressive sights are close within reach. The joy of motorhome rental is that you don’t have to worry about following a set tour or getting to different hotels every night – everything you need is right here, and all that’s in front of you is the long open road and clear blue sky. Christchurch makes the perfect family holiday of a lifetime! Venture to the other worldly, icy landscape of the glacier at Franz Josef and the serene fjord at Milford Sound. Or head out to Kaikoura to spend the day whale-watching on a boat, taking in some of the seal colonies around the bay. Or take a drive through the stunning scenery of the Canterbury Plains, and absorb the serenity of these great open spaces. Christchurch makes a fantastic base for any camper van hire holiday. It has some of the best camping parks in New Zealand, with excellent facilities giving you all the comfort you need, and with a great range of activities for both kids and adults. And with campervan hire you get the luxury you couldn’t buy at even a top range hotel: New Zealand’s natural beauty is right outside your door; if you’re lucky, you might even get a kiwi bird coming to your doorstep! 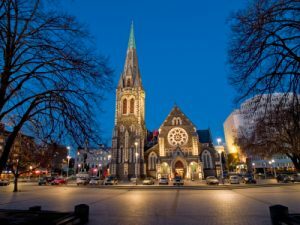 Christchurch has a great range of sights and activities to offer visitors on a campervan holiday. The International Antarctic Centre is a must see, and very popular with kids. Or there’s the Willowbank Wildlife Reserve where you can see close up native kiwis in their natural habitat, and discover the unique traditions of Maori culture on an interactive experience. Or leave your motorhome for an afternoon and change your mode of transport to enjoy the romance of the city on a cruise in Christchurch harbour. With a campervan hire holiday, you have complete freedom to choose where and when you want to go. Take a day trip from Christchurch to Mount Cook, Australia’s highest mountain, and see some of the spectacular natural landmarks such as Lake Tekapo, MacKenzie Basin and the Tasman Glacier, as well as Mount Cook National Park. Or be transported to a world far far away to visit the rugged mountains and glistening lakes of ‘Edoras’, the land of The Lord of the Rings trilogy. Hiring a camper van is the best way to see it all. There’s one highlight campervan holidaymakers pick out again and again from their trip to Christchurch. It’s that magical feeling you get when you are at one of New Zealand’s most famous landmarks, and all the day-trippers start to leave – suddenly you are left with the whole place all to yourself, and nothing but the magnificent natural beauty of New Zealand all around you. This is what makes an RV holiday in Christchurch so special – and will leave you memories of a trip you’ll never forget.